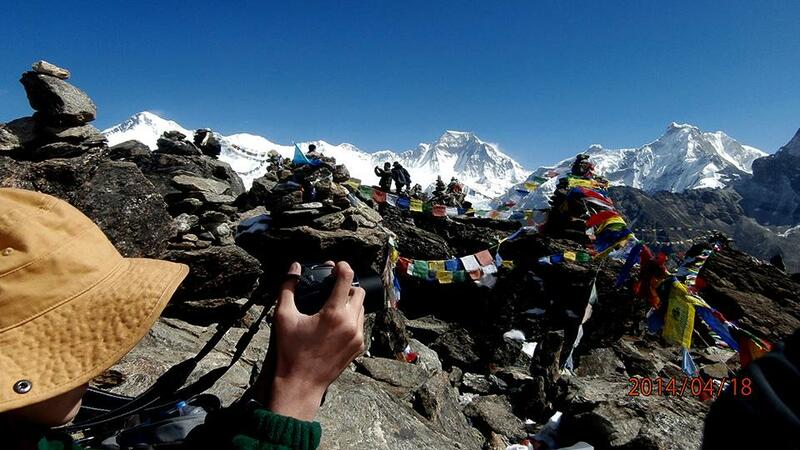 Jiri to Everest Base Camp Trekking is a classic trek in the Everest region. It is long and more exciting as well more rugged for a more adventurous walk. Thie journey to Mt. Everest base camp and Kalapatthar offers beautiful and incredible views of the Everest range. It winds through settlements, green hills, crosses several streams and ultimately ascends through the alpine landscape. Sir Edmund Hillary introduced the trekking trail from Jiri to Everest Base Camp Trek. It was in 1953 when the two renowned figures, Sir Edmund Hillary and Mr. Tenzing Nogey Sherpa took this route for their Mt. Everest expedition. The trek begins from Jiri after a 7-8 hour drive from Kathmandu. The trek starts by crossing green hills, streams and villages. Lamjura Pass is the most beautiful, before reaching Namche Bazaar. The high altitude really begins when the trail meets another trail from Lukla at Phakding. Then the trek enters Sagarmatha national park and continues to Namche Bazaar. This village is a Sherpa hub and scenic settlement. It is also the gateway of the Khumbu region. 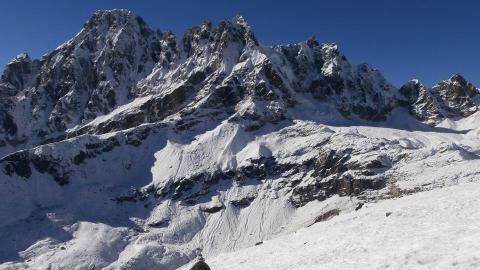 Trekkers can enjoy exploring Sherpa culture and monuments and a hike to the Everest view hotel. Mt. Everest, Lhotse, and Island Peak are all visible and make a stunning backdrop. The Tengboche Monastery is a pilgrimage destination in this region. The trip then continues to Dingboche, Lobuche and Gorakshep. The hike to Everest Base Camp and Kalapatthar offers rare views of the Everest range. The trip ends as it descends all the way to Lukla. 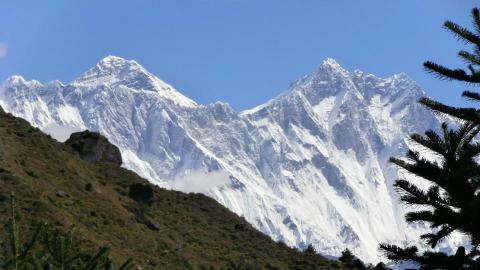 Spring and autumn are the best seasons for the Jiri to Everest Base Camp Trek. The trek is rewarding with both nature and culture. Namaste Treks organises this classic trek from Jiri to Everest Base camp with expert guides and qualiy management. Pleas contact us for detailed information. Day 03: Drive Kathmandu to Jiri and continue to Bhandar. Day 11: Acclimatisation day in Namche Bazaar. Namaste and welcome to the Himalayan country of Nepal. 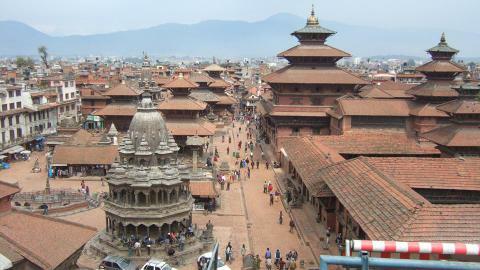 Our company’s representative will receive you at the international airport in Kathmandu. Then, transfer to the hotel and rest. Walk around the local area in the evening. O/N at Hotel. After breakfast, we set off for the Kathmandu city tour. 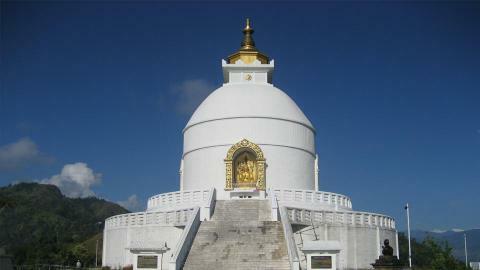 We visit the famous Hindu and Buddhist’ monuments listed as UNESCO world heritage sites. They are Pashupatinath (the greatest pilgrimage site of Hindus), Bouddhanath (Buddhists’ Stupa), Swoyambhunath (Buddhists’ Stupa) and Kathmandu Durbar Square (where the living goddess lives). Back to the hotel and prepare for the trek. O/N at Hotel. Day 3: Drive Kathmandu to Bhandar. After breakfast at the hotel, we drive to the north east (about 190km) from Kathmandu for 6-7 hours. 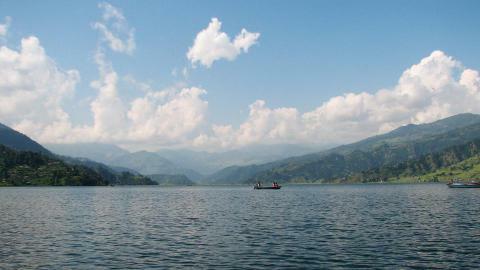 We check in at Jiri and drive to Bhandar, where our trek starts. The road is bumpy from Jiri and we may have to start our trek from Jiri too. The driving in itself is fantastic. We reach Bhandar and rest. O/N at Lodge. 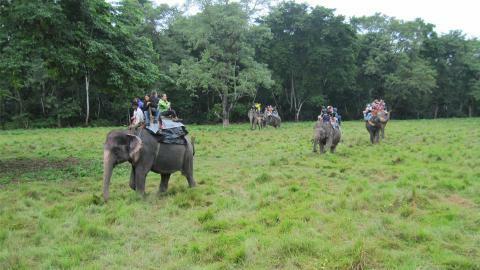 On our first day of trekking, we drive through the dense forest and cross small streams frequently. Crossing the Suruma Khola, we walk towards the Likhu Khola Valley. We gradualy ascend continually leads to Kenja and after a short walk, we reach Sete. O/N at Lodge. We walk on the rugged trail and cross the Lamjura pass (3530m). We walk through the forests of pine and rhododendrons. This is the second highest point after Namche Bazaar. The green hills’ panorama and villages are worth seeing too. We then descend to Junbesi. O/N at Lodge. After breakfast, we trek through the rocky trail with jaw dropping views. We can see Mt. Everest, Lhotse, Nupte, Makalu and other high peaks for the first time. We trek through the Ringmo and Trakshindo pass, which leads us to Nunthala. O/N at Lodge. Today, we walk along the Dudh Koshi River, we follow this all the way into the Khumbu region. We cross several bridges and ascend to Jubing. Then we trek to Kharikhola, cross the bridge and reach Bupsa. O/N at Lodge. After breakfast, we trek through the forest along a tough trail. It is difficult to climb now due to the altitude. We reach Kharte and trek uphill to Khari La pass. The Everest range is outstanding from the top of Khari La. We then trek down to Puiyan and walk further to Surke. O/N at Lodge. After breakfast at the lodge, we trek towards the Chaurikharka. Crossing the rocky trail, we move towards the Chhiplung. We reach Phakding crossing the suspension bridge over the Dudh Koshi River. O/N at Lodge. Day 10: Phakding to Namche Bazaar (3440m). We then march off to the Sherpa Village - Namche Bazaar. The trail enters into the Sagarmatha national park from Jorsalle. It is a fantastic walk from here through the rhododendron and blue pine forest. O/N at Lodge. Day 11: Acclimatisation day at Namche Bazaar. After breakfast, we set off to visit the surrounding area and landscape. 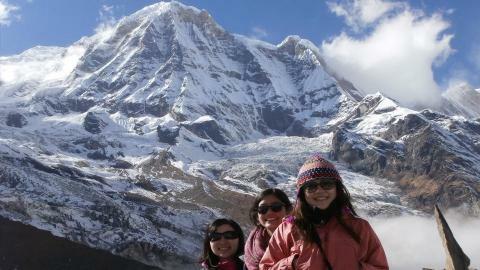 On our hike, we reach the Everest view hotel and see dramatic views of Mt. Everest, Ama Dablam and Lhotse. We then return to Namche Bazaar. O/N at Lodge. Day 12: Namche Bazaar to Tengnboche (3867m). After breakfast, we walk to the Tengboche, our final destination. Following the ridge of Dudh Koshi River and viewing the incredible panoramas, we enjoy our trek. After 5-6 hours gradual walk, we arrive at Tengboche and explore the monastery around the late afternoon. O/N at Lodge. Descending down to the Imja Khola, we cross the suspension bridge and heads further to Pangboche. The trail is beautiful as it is surrounded by the Mani walls. The gradual trek leads to the Dingboche, which is another good viewpoint. O/N at Lodge. After breakfast, we trek to Lobuche from Dingboche. There is tough ascent and descent following the stream. Gradually we reach Lobuche. Due to the increasing altitude, we need to allow ourselves to acclimatised. O/N at Lodge. After breakfast, we walk through the moraine of the Khumbu Glacier and pass by stone memorials for climbers who have passed away on nearby peaks. 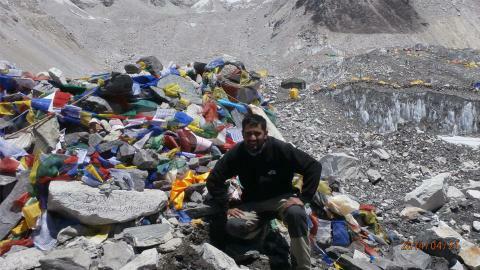 We have luch and rest at Gorakshep beofre hiking up to Everest Base Camp. Then we trek down all the way to Gorakshep and rest. O/N at Lodge. Today, we hike up to Kalapatthar early in the morning with the help of a torch. We bring something to eat and drink on the way because it is the toughest climb of our trip. After reaching the Kalapatthar, we view the breathtaking Everest range and sunrise view rising over it. Then we trek down all the way to Pheriche. O/N at Lodge. 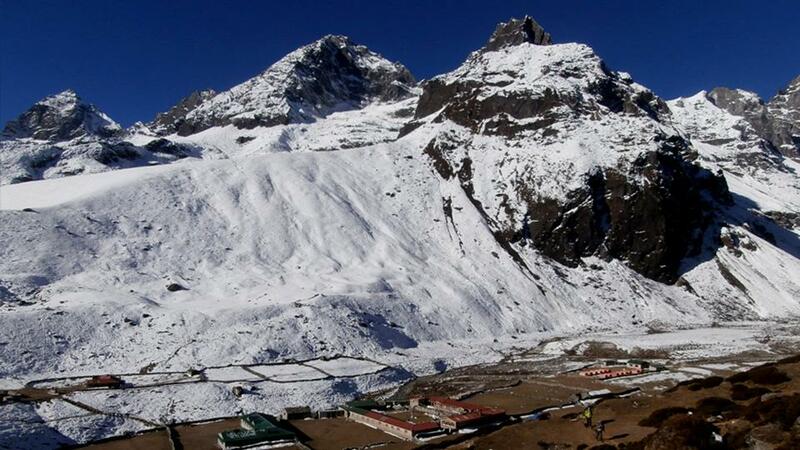 Today, we trek to the beautiful Sherpa hub- Namche Bazaar from Pheriche. 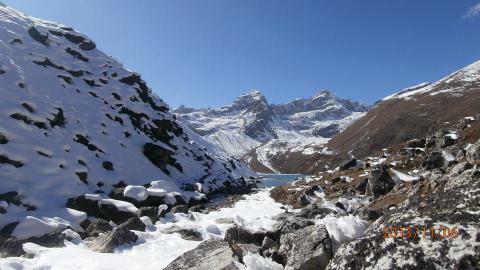 We reach Pangboche and continue past the Dush Koshi River. The walk is pretty fast and we trek down to Namche Bazaar. O/N at Lodge. Today, we have pretty long walk to Lukla from Namche Bazaar. First we trek down to the Phakding and cross several farms and gorges. After about three hour walk, we arrive at Lukla. O/N at Lodge. We fly to Kathmandu from Lukla. Arrive at the airport and transfer to the hotel. O/N at Hotel. This is a free day for you to do shopping and visit the nearby tourist spots. On this day you can rest and walk around the local markets. Enjoy your dinner in the evening and go to bed. O/N at Hotel. We bid you farewell today. Our representative drops you at the international airport for your departure. Thanks for joining us for your memorable trip. Note: Due to the bad weather, flights can be delayed or postponed. Breakfast, Lunch, dinner and accommodation in package trekking in the mountain. Lukla - Kathmandu flight tickets. TIMS and the Sagarmatha National Park entry permit.